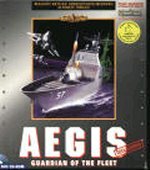 "AEGIS: Guardian of the Fleet is a simulation of the U.S. Navy's Ticonderoga class guided missile cruiser. Over 100 missions are available in 7 battlesets and a training area. AEGIS could be called a "system simulator" since it individually models many of the offensive, defensive, and sensor systems present on the Tico class. Once the program is installed and run, you are presented with the options screen. Here sounds and music can be toggled, games saved and loaded, difficulty level selected, and missions begun. There are 3 difficulty levels: beginner, intermediate, and advanced. At beginner level the player can see all enemy forces whether or not they are detected by sensors, as well as control the enemy forces. Intermediate level enemies have to be detected and are completely computer controlled. However, they will not use countermeasures when fired upon. At advanced level the enemy forces will use countermeasures. The player has the option of playing a single mission, all the missions in a single battle, or a campaign, which is every mission in each battleset. The 7 available battle areas are: the Falklands War, Libya/Tripoli, Persian gulf, Desert Shield, Desert Storm, Black Sea, Adriatic Sea. The Tico class was undergoing sea trials during the Falklands War, so this scenario is a "what if". The Black Sea and Adriatic scenarios are also fictional. I really wanted to like AEGIS. 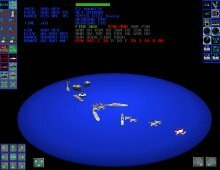 I have always been fascinated by modern naval warfare and have a lot of experience with the original miniatures version of Harpoon and the later computer version. I was initially impressed with the attention to detail put into AEGIS. The numerous sonar, radar, and weapon control screens were very realistic. The online Warbook presents information about every piece of hardware in the simulation and reads like "Janes' All The World's Ships." The designers really put a lot of time into researching the database. The missions are firmly based on history (especially the Falkland War missions) and all seem very plausible. There is only one type of group order you can issue, and that is a weapons free clearance: all friendly units will automatically fire at any enemy unit within their weapon range. When attacking enemy ships this presents a problem because your friendly ships, when firing missiles at enemy targets, will only fire one missile at a time. Often the only way to sink an enemy ship is to overwhelm its defenses with a large number of missiles, but your ships will only fire one missile, wait until it hits or is shot down, and then fire another. This makes it extremely difficult to destroy a well defended enemy ship.With the amount of detail the designers put into the game, it is hard to believe some of the things that are present in AEGIS. Aircraft never run out of fuel and can never land at a base or aircraft carrier, nor can they be launched. Ships can not run aground, and can even cross the shoreline and sail through the land. Damage does not affect a ship or aircraft until it is destroyed. If anything breaks the "suspension of disbelief", this is it. Even the smallest missile will cause damage to the sensitive electronic systems on modern warships. Two of the major concepts of ASW (anti- submarine warfare) are completely ignored: thermal layers and the baffles. Sensor operation is simplified to the point that once a detection is made, you instantly know exactly where the enemy unit is; no partial detections giving only the bearing to an enemy are possible. Overall, I feel that AEGIS is a good attempt. Someone who knew very little about modern naval warfare would probably enjoy it without noticing the problems I have outlined. The awkward interface and unrealistic details greatly lessened my enjoyment. I can't help but wonder if the designers ever played computer Harpoon and saw how an effective interface could make controlling large numbers of units easy."